Ever since we posted last year about how our product is ideal for community gardens, we've had a steady stream of customers from that arena. Their stories have a common theme: they need to collect rainwater where there is not a roof in sight. Some of these gardens are motivated by limited or no access to city water while others are worried about increasing water costs. A few are further engaged in community outreach and they consider a rainwater harvesting display to be ideal for education purposes. As we have worked with community gardens, we've gotten feedback that what they need are large rain collection areas that have a small footprint on the ground so they can easily fit inside the typical plot. In other words, we needed to come up with a way to connect several RainSaucers into one barrel while making sure the system stays up and out of the way. To that end, we have devised the following method (see picture right). 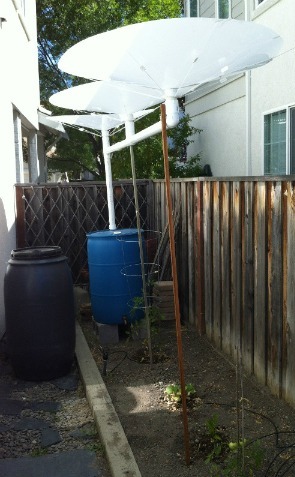 This system has three 48" RainSaucers plugged into a single 55 gallon drum, raised to a height of over 6' off the ground. 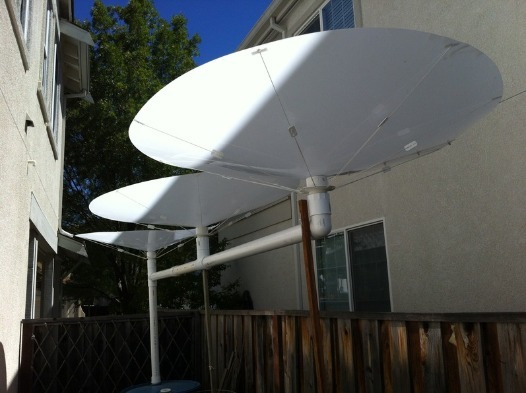 The 3 unit arm is made of 2 x 4' sections of 2" pipe, 2 x 2" tees, 1 x 2" elbow, 3 x 2" female fittings, and 2 x extra tall garden stakes. 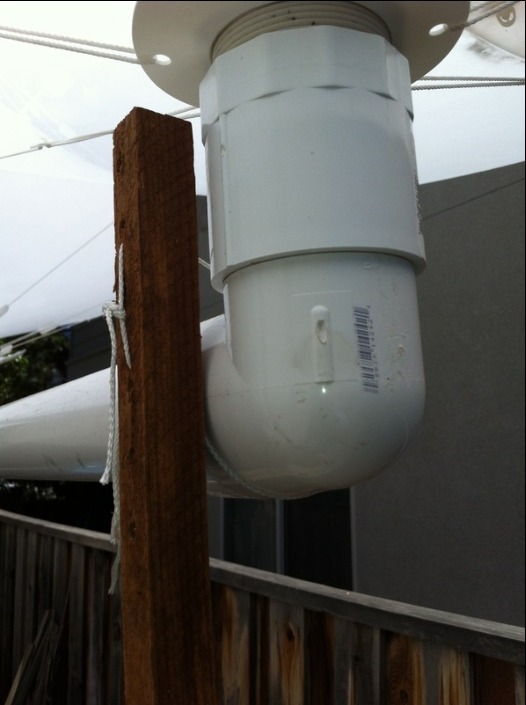 The arm connects to the drum with an additional 2" pipe sized to the desired height. The female fittings connect to the tees and elbows with 2.5" pieces of 2" pipe. As for the barrel, three cinder blocks were deployed in a "U" formation for support and PVC glue will be used to secure all slip connections. We used the grommet and faucet from the DIY Kit that we sell for dispensing water into a watering can. Total catchment capability of this system: over 20 gallons per inch of rain (will fill the blue drum with less than 3 inches of rainfall). The support stakes were located at the middle and end points. This end point stake was cut to size and two holes were drilled into the side allowing string to be threaded through the stake and around the elbow.